The current pipeline can tell you everything you need to know about product approvals for the better part of the next decade. If it isn’t in the pipeline at this point, it won’t be approved before 2025 given the time required for clinical development and regulatory approval. Unfortunately, the pipeline is subject to all sorts of internal and external forces that create uncertain outcomes. Like a lottery, we may know all of the numbers, but we don’t know which are the winners. Confidence in pipeline details drops as we look further back in the development pipeline, especially Phase 2 and earlier. Not only is there limited information available for these early stage products, in many cases, these products are not even fully “baked,” with surprises yet to be discovered. This pipeline review, centered on drug delivery and formulation products, looks forward and back 5 years, a total of 10 years. Looking back at product approvals is easy enough; approvals are publicly available along with considerable detail. The 5-year forward snapshot is captured by examining the products now in Phase 3 and Registration stages of development. The earliest of these pipeline products may be approved in a year or less, while others may still be 5 years from approval. It’s these Phase 3 and Registration products that will define the near-term direction of the pharmaceutical industry. The analysis that follows is based on the PharmaCircle Pipeline & Products Intelligence module covering major market approvals and publicly disclosed development products. APPROVED for the balance of this article refers to products that received a first major market approval between 2013 and the end of February 2018. Numerically, this group excludes supplementary approvals for new indications or new dosage strengths. It does include new dosage form approvals of previously approved products, for example, a sustained-release formulation of a product that was previously approved as an immediate-release product. PIPELINE refers to products that were listed as either filed for Registration, or in active Phase 3 development as of the end of February 2018. Generics and biosimilar products are not included in either group. Figure 1 below provides a snapshot of APPROVED and PIPELINE products. A total of 1038 Approvals and 1661 Phase 3/Registration products are included in the analysis. The charts present results as percentages to improve clarity. Numbers can be estimated by multiplying together the percentages and total numbers. With respect to the near-term future in terms of Indication, the emphasis clearly is on Cancer, at the expense perhaps of Infections and Endocrine/Metabolism. Figure 2 summarizes products as a function of Administration Route. There are no real surprises. 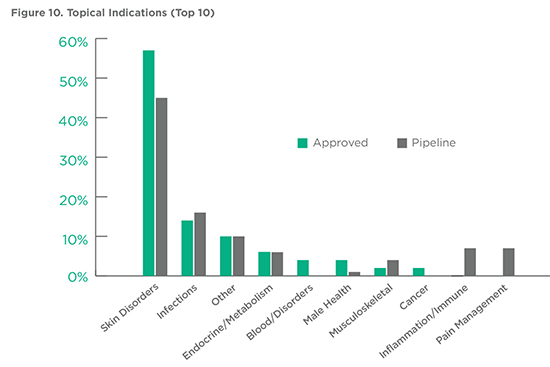 There seems to be a drop in the development of PIPELINE Oral Products and an uptick in Injection Products, possibly reflecting the increasing interest and investment in Cancer Products. There is an apparent shift in terms of Molecule Types being developed. PIPELINE products show a drop in Small Molecules with an increase in Antibody and Peptide products relative to APPROVED products. Cell and Gene Therapy Products represent a relative drop in the bucket yet are showing a strong increase in late-stage development. Oral Dosage forms comprise a wide range of dosage forms from Tablets to Films to Syrups. 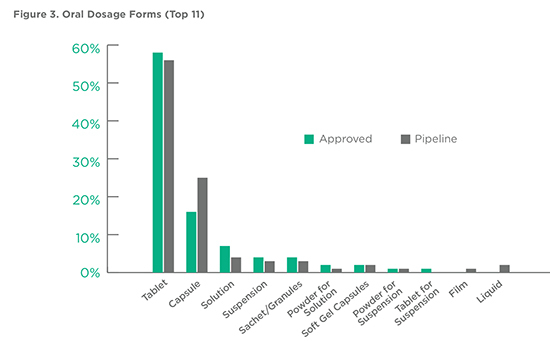 Tablets continue to be the number one dosage form, accounting for more than half of all recently approved and late-stage products but seem to be slipping as shown in Figure 3. The slippage in Oral Tablet products seems to be taken up by Oral Capsules. The indications addressed by Oral Products showed some interesting differences in terms of APPROVED and PIPELINE products with Infections showing the largest drop and Cancer the largest increase. There was little difference in terms of the number of Oral Products that were labeled as drug delivery (27%) versus those that used no drug delivery or formulation technology (73%) in the two groups. 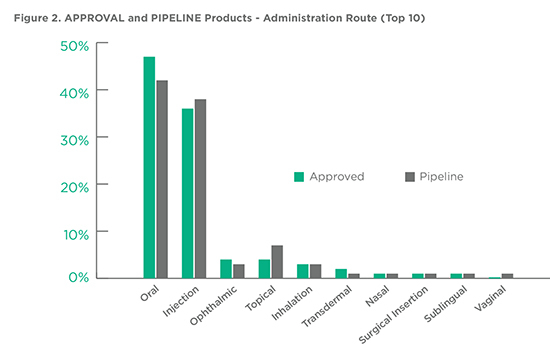 The same situation was seen with Molecule Type for Oral Products, with Small Molecules accounting for 97% of APPROVED and 95% of PIPELINE products. There are fewer PIPELINE (17%) than APPROVED (25%) Combination Products. Injectable products cover a wide range of presentations from simple Injection Solutions to Lyophilized Powders to Implants. 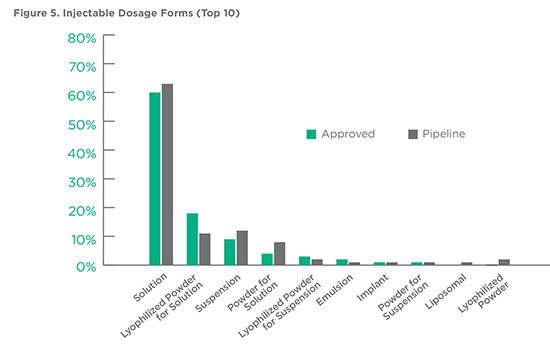 Injection Solutions, typically not involving a drug delivery and formulation technology, is the leading Dosage Form, accounting for more than 60% of all products, with a slight increase seen in PIPELINE products. 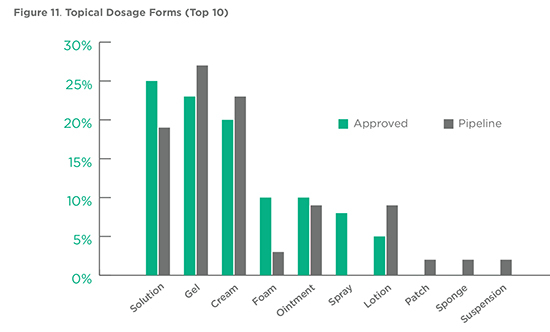 Indications addressed by Injectables show a shift in terms of emphasis when comparing APPROVALS and PIPELINE products. 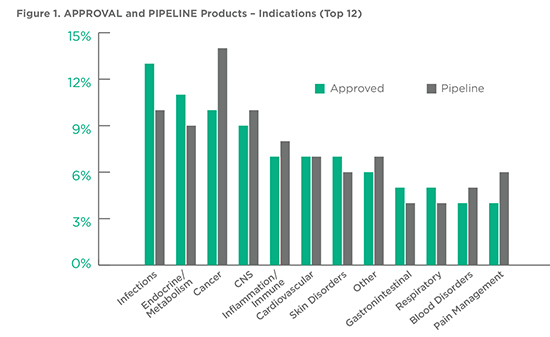 Cancer has become the number one indication for PIPELINE products, with a significant jump over Infections. Endocrine/Metabolism is trending down, while CNS is trending up. A shift is also seen in Molecule Type with a drop in Small Molecule Injectable PIPELINE products. The difference is picked up by Peptide and Cell/Gene Therapy products, which together account for 20% of all PIPELINE Injectable products. 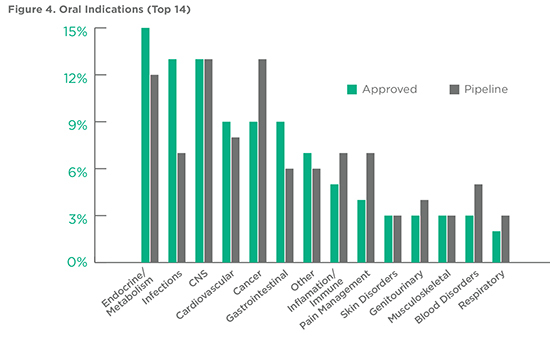 Drug delivery and formulation enhanced Injectables accounted for about 40% of all Injectable products, 44% of APPROVED and 37% of PIPELINE products. Inhalation products represent a relatively small number of products, a bit fewer than 50 for each of APPROVED and PIPELINE products. An additional product or two in any category can significantly shift apparent trends. 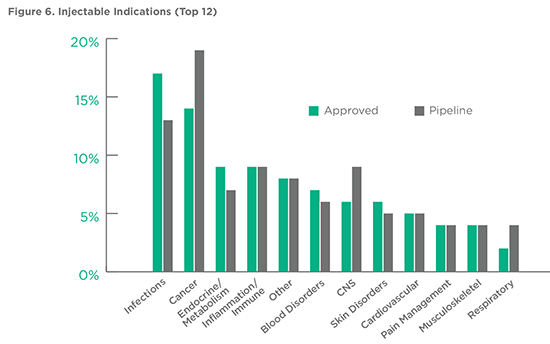 Indications for Inhalation PIPELINE products show a shift relative to APPROVED products. 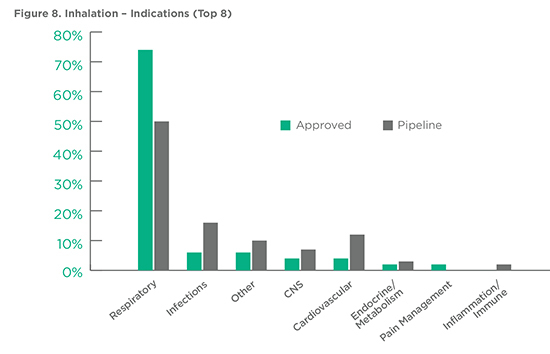 The drop in PIPELINE Respiratory products (Asthma and COPD) is accounted for by an increase in products targeting Infections and Cardiovascular Disease, largely Cardiopulmonary Hypertension. Molecule Type shows an increase in the number of Proteins, Carbohydrates, and Peptides in late-stage development versus what was approved in the past 5 years, with Small Molecules accounting for 98% of APPROVED and 80% of PIPELINE products. These larger molecule therapeutics are for the most part treating local and loco-regional rather than systemic conditions. Combination Products are losing a little bit of their shine in terms of Inhalation PIPELINE products, perhaps as a result of the upswing in single-agent products being developed for Infection and Cardiovascular indications. Topical products are a hodgepodge of products addressing local and systemic indications as reflected in Figure 10. A total of 40 APPROVED and 105 PIPELINE products were included in the analysis. There seems to be some trend toward products that address systemic type indications, Inflammation/Immune and Pain Management, at the expenses of more traditional Skin Disorder indications, such as Dermatitis and Acne. 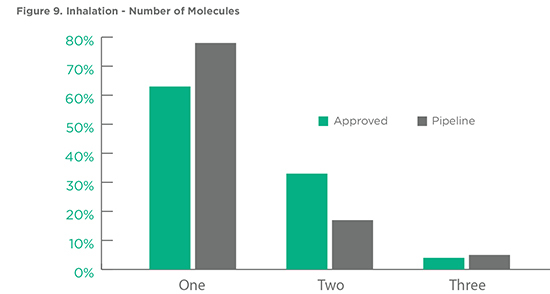 Unsurprisingly, Small Molecules dominate the Topical product area representing a little less than 90% of all products for both APPROVED and PIPELINE products. 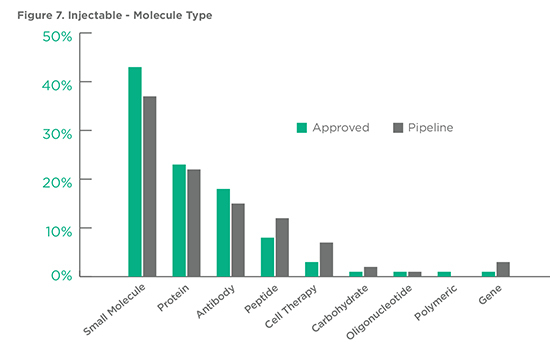 PIPELINE products show a little more variety with Peptide, Oligonucleotide, and even Cell Therapy products in late-stage development. With Topical products largely targeted to local or loco-regional indications, Dosage Forms are required to optimize patient acceptance and stability. This is reflected in the distribution of product forms that range from solutions to gels to creams to sprays and dressings. Combination Products represent a relatively small proportion of Topical products, 20% of APPROVED and 10% of PIPELINE products. As noted in Part 2: Notable Product Approvals of 2017 of this 2017 Drug Delivery and Formulation Review, pharmaceutical products can be viewed as trees in the forest of a pharmaceutical ecosystem. Individual products in this ecosystem define the character and nature of the forest. Like any healthy ecosystem, things change naturally as products age and are replaced by newer, often different, varieties of pharmaceutical products. Looking at the forest of the pharmaceutical pipeline 5 years out, one finds that while it looks much like the forest of 5 years ago, there are hints of new species in the pipeline. Indication focus is certainly evolving. A greater understanding of cancer, increasingly common successes, and the pricing premium afforded these products, has supported a shift in investment that is evidenced in the near-term pipeline. Drug delivery and formulation seems to be receiving less attention than it did 1, 2, and 3 decades ago. Many of the easy and most obvious new drug delivery and formulation opportunities, sustained-release oral and systemic transdermal products, have been realized. The larger challenges, delivering proteins and antibodies systemically through non-injection routes, have not yet been adequately addressed. This has forced the industry to incrementally improve the outpatient injection experience through better designed devices and extended dosing intervals. These approaches are threatened by the development of novel small molecule products, such as the newer treatments for Hepatitis C, that forgo the need for large proteins and their delivery challenges. Companies that can deliver next-generation drug delivery and formulation technologies will require considerable investment. It’s not clear that there is an appetite for this type of investment in the absence of some substantial proof-of-concept. Examining 2017 early stage company investments related to drug delivery and formulation reveals that less than 10% of the funds, about $30 million, were targeted to what might be considered drug delivery technology; the balance being earmarked for product and corporate expenses. A deeper pipeline of drug delivery and formulation with expanded features and capabilities will require breakthrough technologies. Breakthrough technologies require the necessary investment of time, effort, and money. Based on current evidence, it seems that it will be a decade before this next generation of drug delivery and formulation products are ready for approval, assuming of course the necessary investments are made sooner rather than later.